Artwork Panel: 50.3cm x 97.2cm ≈ 19¾" x 38¼"
Silk/Brocade: 59.3cm x 153cm ≈ 23¼" x 60¼"
Reason for discount: Very minor spot in painting. This is a unique form of calligraphy. It's a Chinese character that is made to look like an actual figure. In this case, an older man with a wispy beard holding a peach. Note that a peach is also a symbol of longevity in Chinese culture. 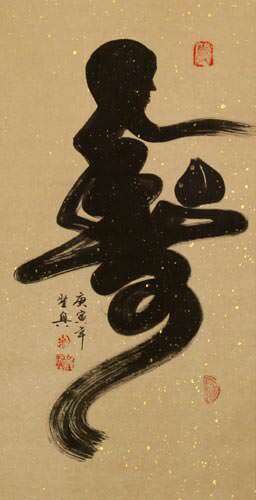 The large character is also a representation of "shou" which means longevity and long life in Chinese.